The Smoky Mountains have a variety of places to eat including sit down and fast food. Enjoy southern style home cooking, great Italian food, Chinese buffets, Southern BBQ, seafood, steaks, pancakes or a host of other fine foods in the area. After relaxing in your rental cabin or a fast paced day of Pigeon Forge Attractions, sit down to some of the best food in the South! See the list below for satisfies your hunger. 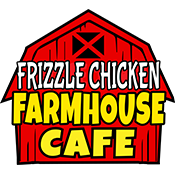 Located next to the World Famous Comedy Barn® Theater and stocked with over 100 singing animatronic chickens, the Frizzle Chicken Farmhouse Cafe is ready to serve you the best and MOST FUN Southern style breakfast, lunch, and dinner you have ever tasted! From gourmet pancakes to signature biscuit dishes to Fried Catfish, there is something on the menu for everyone! Come hungry and then prepare to leave full. Now Open for Breakfast, Lunch, and Dinner! 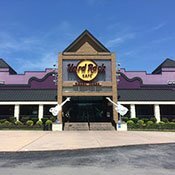 Hard Rock Cafe is located in Pigeon Forge, TN near Wonderworks and Smoky Mountain Opry. Enjoy great food while being immersed in rock and roll memorabilia. Don't miss this must dine experience. 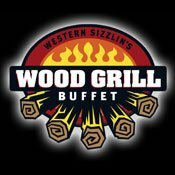 Wood Grill Buffet has now opened in Pigeon Forge, TN. Now you can enjoy a scrumptious buffet featuring the tasty signature items that have people raving about Wood Grill Buffet. 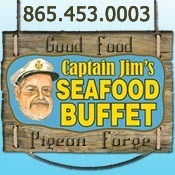 America's largest buffet with seating for your family or groups of several hundred. Come and enjoy our grilled steaks, smoked ribs, succulent shrimp, tasty fried chicken and much, much more! Always a great choice when you're visiting here in Pigeon Forge. There is something to make everyone in your party happy. Come visit with us soon!! !